As the year of 2014 concludes, the website of the Patriarchal Parishes in the USA has published a photo-report containing photographs of notable events occurring within the life of the Patriarchal Parishes in the USA this year. In honor of the feast of the Nativity of our Lord and Savior Jesus Christ, the website of the Patriarchal Parishes in the USA will be publishing photographs of the Divine Services in the parishes. On Friday December 19, the feast of St. Nicholas the Wonderworker; His Grace Bishop John of Naro-Fominsk, Administrator of the Patriarchal Parishes in the USA led the Divine Liturgy in St. Nicholas Cathedral, NYC on the occasion of its patronal feasday. On Saturday, December 13, on the feast of Holy Apostle Andrew the First-Called; clergy and faithful flocked to St. Andrew Cathedral in Philadelphia, PA, to mark the parish's patronal feastday. 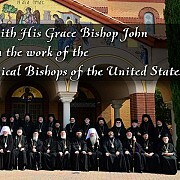 During the Assembly of Canonical Bishops of the USA in September of 2014, His Grace Bishop John of Naro-Fominsk was interviewed on the continued fruitful works of the Assembly. 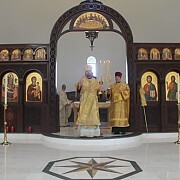 On Sunday December 15, with the blessing of His Eminence Archbishop Demetrios of the Greek Orthodox Archdiocese and at the invitation of Protopresbyter Alexander Karloutsos, Rector; His Grace Bishop John of Naro-Fominsk, Administrator of the Patriarchal Parishes in the USA celebrated Divine Liturgy in Holy Dormition Church in Southampton NY. On Sunday, December 7, the feast of St. Catherine the Great-Martyr, His Beatitude Metropolitan Tikhon of all America and Canada presided over the Divine Liturgy in St. Catherine Church in Moscow, Russia. 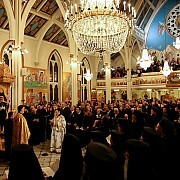 On Saturday, December 6, His Eminence Metropolitan Joseph of All North America of the Antiochian Orthodox Church was enthroned in St. Nicholas Cathedral in Brooklyn, NY. 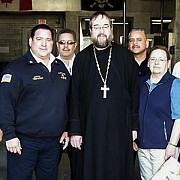 Archpriest George Konyev represented the Patriarchal Parishes in the USA. 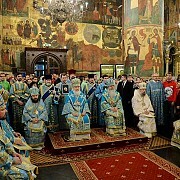 On December 4, the great feast of the Entry of the Most Holy Theotokos into the Temple, His Holiness Patriarch Kirill of Moscow and all Russia served the Divine Liturgy with His Beatitude Metropolitan Tikhon of all America and Canada in the Cathedral of the Dormition in Moscow, Russia. On December 3, His Holiness Kirill, Patriarch of Moscow and all Russia hosted the delegation from the Orthodox Church in America headed by her Primate, His Beatitude Tikhon, Metropolitan of all America and Canada at the Patriarchal Residence in Danilov Monastery in Moscow. 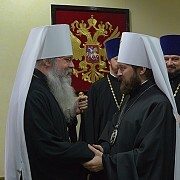 On December 2, 2014, His Beatitude Tikhon, Archbishop of Washington, Metropolitan of All America and Canada, Primate of the Orthodox Church in America, began his official visit to the Russian Orthodox Church. On December 1st, Priest Stephen Kaznica and parishioners of Sts. Peter & Paul Cathedral delivered over 100 toys that the parish had collected on behalf of the Passaic, NJ Fire Department's annual toy drive. 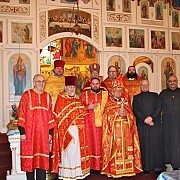 On November 18-19, the clergy of the Central States Deanery of the Patriarchal Parishes in the USA gathered to celebrate the Divine Liturgy and to hold an annual deanery meeting at St. Michael Church in Redford MI.